Here is a comparison of two 27-inch TV sets: the Panasonic CT-27SF36 ($600 street) and the JVC AV-27920 ($300 street). The image is a 720x480 DV frame sent live from my computer through a firewire cable to the TRV900, and out via S-Video to each TV. I took pictures of the screen on 35mm film (Kodak Gold 200, f/11, 1/2 second) in a darkened room, and scanned the negatives to produce the images you see here. The film is daylight-balanced and I did not apply any color correction, so the color is not very accurate. 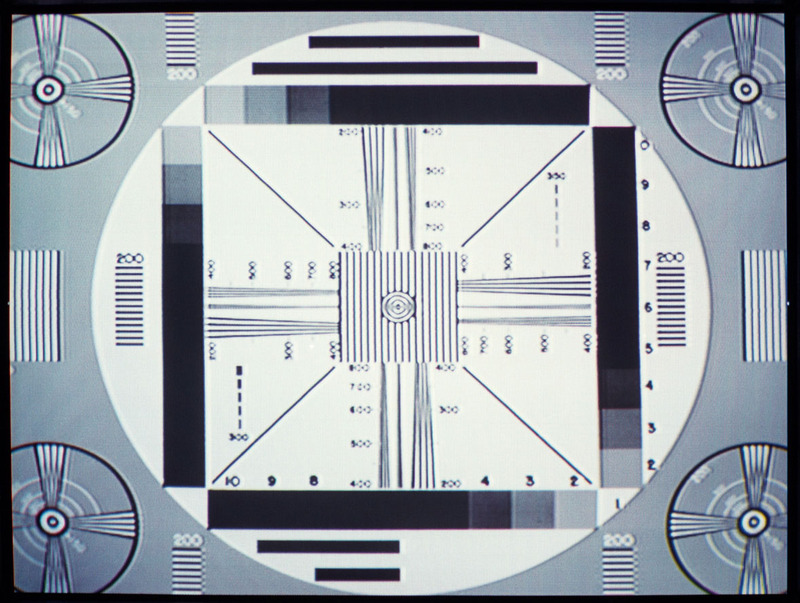 The film process reduces the contrast, the TV image appears to the eye to have a larger contrast range than is shown here. 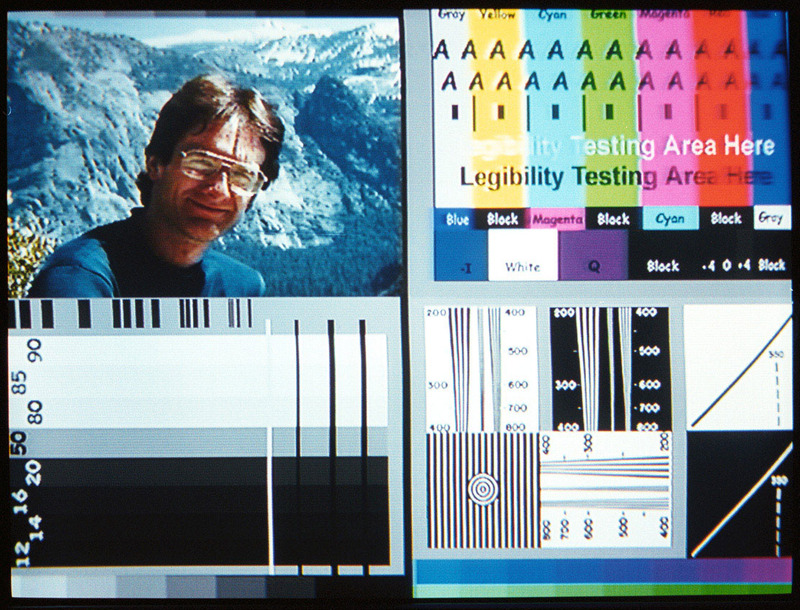 Upper left quarter of screen: detail from image test. Compare to original image. 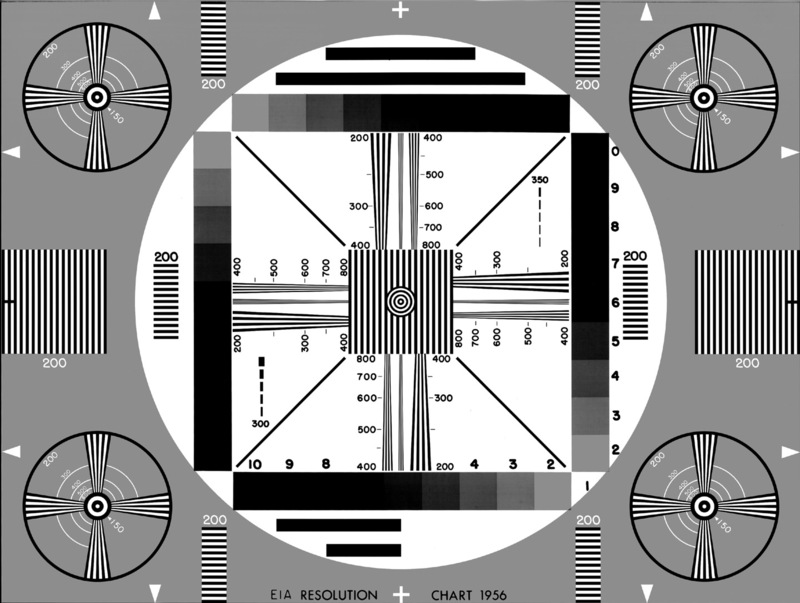 Center portion of resolution pattern: image detail. Compare to original image. 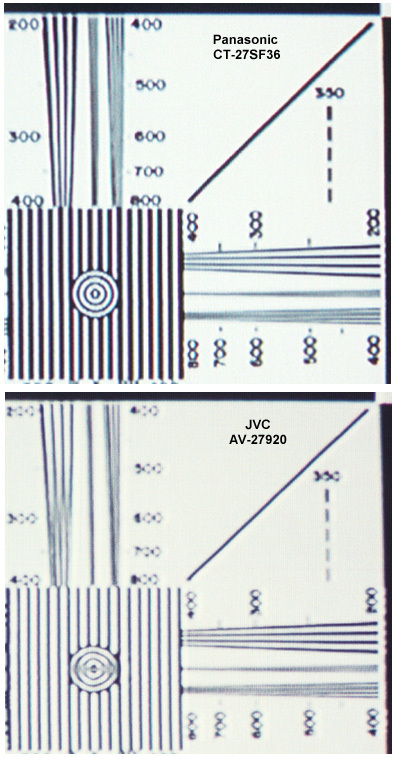 The JVC has a conventional tube which curves in both axes. 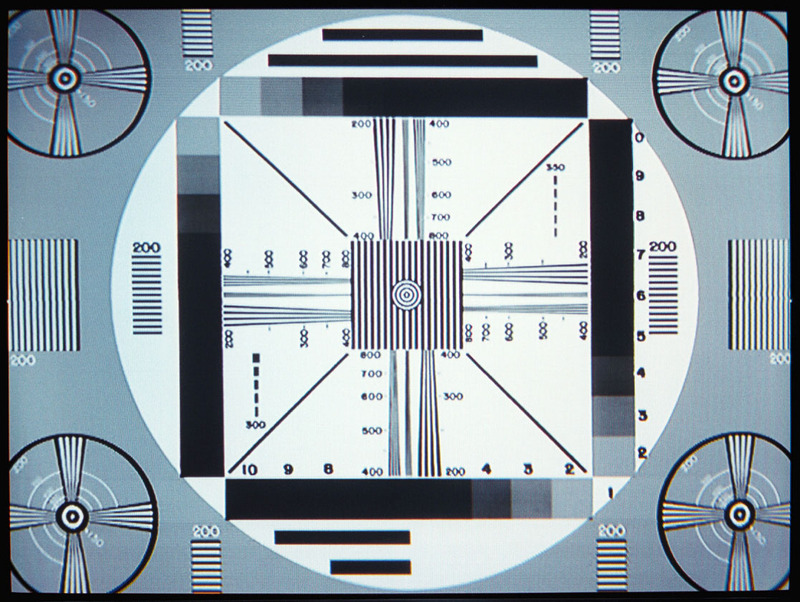 The Panasonic set has a "superflat" tube (the screen surface is a cylidrical section, rather than spherical: it curves horizontally but is flat vertically.) The flatter screen is nice but not a vast improvement. Due to the larger stress, the glass is thicker and the set weighs more (90 lbs). The Panasonic set definitely has a sharper image, which works impressively well at improving image quality from low-resolution sources (eg. VHS tape). With high-resolution signals, like DV or DVD, it accentuates edges more than I'd like. (There is a "sharpness" control; I turned it all the way down to zero, but this seemed to produce little change). 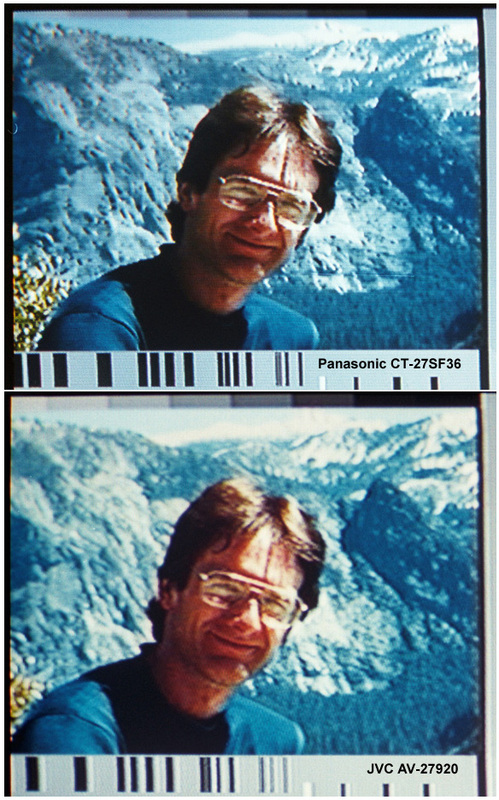 For example there seem to be large warts on my face in the Panasonic image, where the original image has only slight shadows. The Panasonic has slightly less overscan, so you see a bit more of the full image resolution pattern. It also has a somewhat dark region at upper left, which is a defect, but it is not usually bothersome in normal viewing, so I'm not motivated to lug this 90-pound set back to the store. 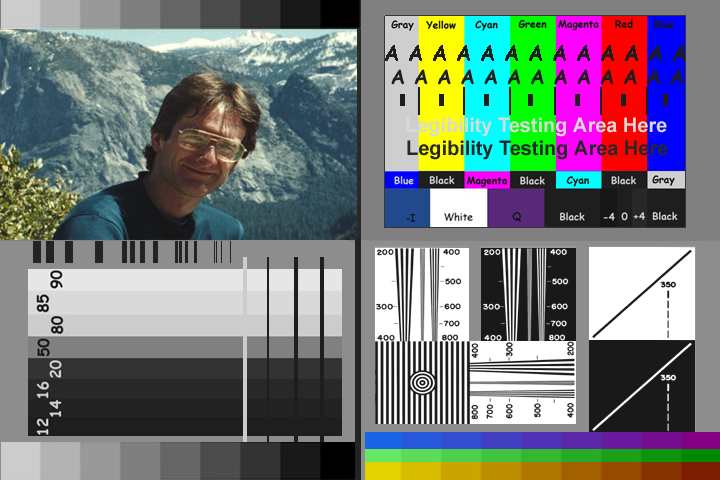 The JVC does not reproduce equal-width lines and spaces (see test pattern), has more geometric distortion where large image areas are bright white, and has some sort of color-subcarrier filter that causes detail near 300 lines of resolution to blur. 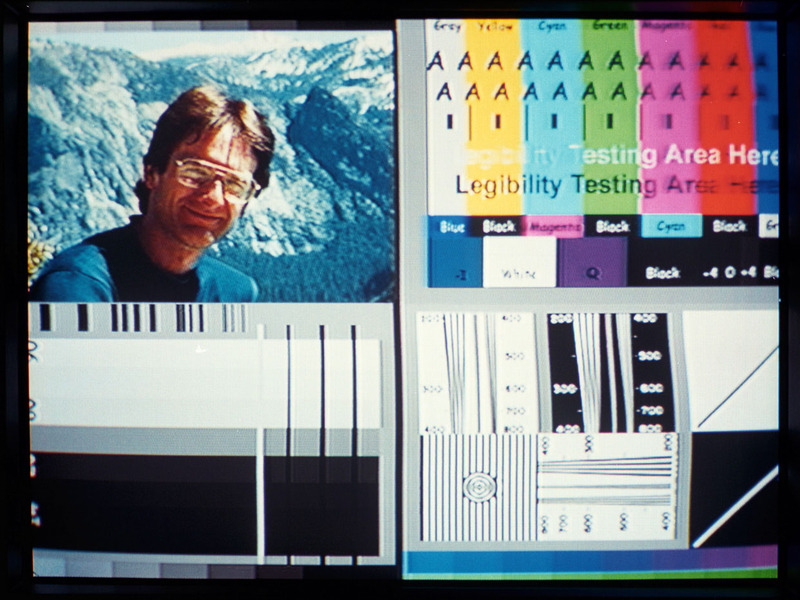 By the way, the JVC claims 500 lines of resolution, and the Panasonic claims 800 lines. It's a mystery to me how they measure that. According to my observations I would claim about 60% of those figures, respectively. At any rate, I do like the Panasonic, and I'm getting rid of the JVC.